Jim Acher at bluewater tells me the owner of Trilogy is keen to sell, authorising a near-20% price cut and still willing to entertain offers. Built by Tempest Marine in 1990, Trilogy is a 32m motor yacht which underwent a substantial refit in 2005. The refit included a hull extension, new paint, new A/C, new teak decks, major works to all machinery, and upgraded electrical systems. She has four cabins for eight guests, and also features Naiad stabilisers. Twin 1000hp Caterpillar engines give her a cruising speed of 13 knots. 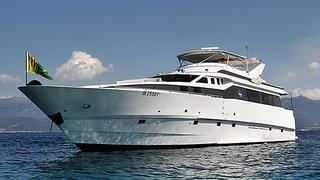 Currently out of the water in Mallorca for winter maintenance, Trilogy is down from €725,000 to €595,000 VAT paid.